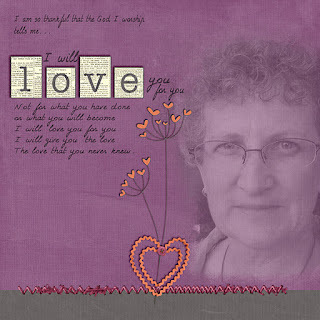 " Love You for You" is the title I have given this page I created for a challenge over at Stuff to Scrap. You can find the challenge details HERE . We were given the words to the song "What Love Really Means" by JJ Heller, and asked to use something from this song on a layout. I chose to use the last verse as it means so much to me... to think that the God, I worship - the one true God Loves me for me!.... not for anything I had done or anything I will become. After I share my page I will share the Youtube of JJ Heller singing the song. I already owned two of JJ Heller's CDs and after hearing this song because of this challenge I bought the CD that has this song on it. Sometimes when I am doing my paper crafts or digital scrapbooking I will play her CDs in the background. I challenge anyone who visits this blog of mine to also create a page using the same verse I have as it is such wonderful words and a good reminder that God's grace is so freely given... we do nothing to deserve it. If you take up my challenge, please let me know in a comment if you share your page on your blog so I can visit your blog and see what you create. Fabulous. This really lifted my heart today. TY. I'll check out the challenge. What a beautiful page and a beautiful song Anne Marie! I haven't heard of this singer before but love her voice and will listen again.This is just what I needed today to encourage my son who is at a new school and is feeling as if he doesnt fit in.He isn't very academic but God loves him for who he is and has given him other talents.I will dfinately make a page and post it on my blog. Thank you ! You've created a very beautiful page, Anne-Marie! It's wonderful to see your pretty face there along with those wonderful words!